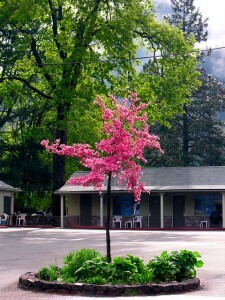 Welcome to Dunsmuir Lodge, a charming motel in Dunsmuir, California. WELCOME to Dunsmuir Lodge, located in the quiet, beautiful mountains of the Upper Sacramento River Canyon, with renovated cottage-style rooms and off-street parking. Our motel is the perfect place to stay while you enjoy the natural beauty of the Mt. Shasta area. We have comfortable and immaculately clean rooms to greet you. All of our rooms are smoke-free and we invite you to bring your pet with you for your stay. We have a lovely meadow and outdoor areas for you to enjoy. Our rooms are reasonable in price and we know that you will be glad you stayed with us. We will make you feel welcome and very comfortable while you are here at Dunsmuir Lodge. Our motto is: Once a guest, always a friend. If you’re looking for lodging in south Siskiyou County, explore the web site and make your reservations soon! Whether you’re here for business or just passing through, fly fishing on the Upper Sacramento River, or skiing and snowboarding at Mt. Shasta Ski Park, we look forward to seeing you. We are easy to find and have just what you need.